The Diocese of Bangalore was formerly a part of the Mysore Mission which was separated from Pondicherry in 1845 and entrusted to the Fathers of the PARIS FOREIGN MISSION SOCIETY (Missions Etrangeres de Paris). The Mysore Mission was erected into a Vicariate Apostolic in 1850 and entrusted to Msgr Charbonnaux, MEP, who was at that time coadjutor Bishop of Pondicherry. In 1886, the Bull “Humanae Salutis Auctor” elevated the Vicariate of Mysore to the rank of a Diocese. Mysore was the title and Bangalore was the headquarters of the Diocese. All along the second part of the 19th century and the ?rst half of the 20th the Foreign Mission Society, under successive Bishops, developed a network of churches, schools, convents and colleges. Thus they prepared Bangalore to become an Archdiocese, a great capital and a cosmopolitan city. The Christian infrastructure of Bangalore owes much to the French Fathers, Servanton Circle in Cantonment area and The Briand Square near City Market perpetuate the memory of the Founders. The above two, along with the following, viz., SAINT FRANCIS XAVIER’S CATHEDRAL whose ?rst Parish Priest was Fr. Jarrige in 1842, and SAINT JOSEPH’S CHURCH built by Fr. Bigot-Beauclair in 1851-1852, SAINT MARY’S BASILICA, started as the ?rst church in Bangalore, was built as we see it now, by Fr. Kleiner between 1875 and 1882 before he was made Bishop. The SACRED HEART CHURCH was completed in 1895 by Fr. Combret. The then Cathedral, SAINT PATRICK’S CHURCH was completed by Fr. Gailhot in 1844 and renovated by the illustrious Fr. Tabard who was its Parish Priest from 04.12.1891 till 12.04.1925. He is buried inside the church. The SAINT PETER’S SEMINARY at Malleswaram, now a Philosophy and Theology Faculty and Centre for Canon Law, was established in Pondicherry in 1777 by Bishop Brigot, ?rst MEP Superior of the Malabar Mission. The Seminary was shifted to Bangalore in 1934. SAINT JOSEPH’S COLLEGE was founded in 1882 by MEP Fathers. It was handed over to the Society of Jesus on 1st June, 1937. By the Bull “Felicius Increscente” (happily growing), Pope Pius XII created on 13th February 1940 the Diocese of Bangalore, carving it out the Diocese of Mysore. Most Rev. Bishop Maurice Bernard Benoit Joseph was appointed as the ?rst Bishop of the newly erected Diocese of Bangalore and St. Francis Xavier’s Church was designated as the Cathedral. Most Rev. Dr. Thomas Pothacamury who was the Bishop of Guntur was transferred to Bangalore and became the First Indian Bishop of Bangalore in 1942. The Cathedral was consecrated on 24th January 1948. On 19th September 1953, Pope Pius XII issued the decree “Mutant Res” (things are changing) by which Bangalore was elevated to Archdiocese. 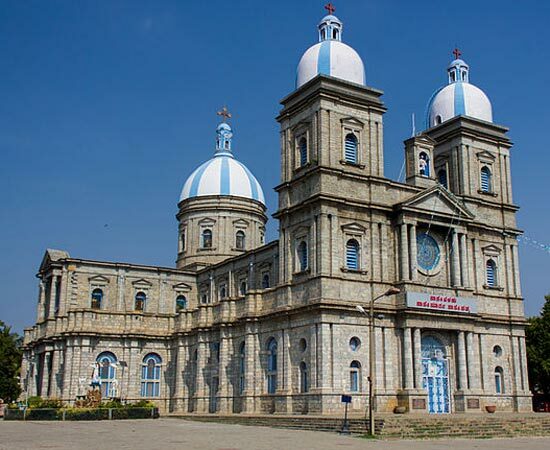 On 14th November, 1988, the Diocese of Shimoga was created to which Bangalore Archdiocese ceded the civil district of Chitradurga. Thus the Archdiocese of Bangalore now comprises six civil districts of Bengaluru Urban, Bengaluru Rural, Chikkaballapura, Kolara, Ramanagara and Tumakuru. These cover an area of 27,123 sq km with a total population of 1,71,65,595 as per the census of 2011. Currently the Catholic Christian population is 3,78,869 (2018).